education (includes state universities and financial aid/grant programs). • Require State to fund any deficiencies from General Fund. community colleges and state universities; shift remaining portion to state. foundation allowance and those receiving maximum foundation allowance. Should this proposed law be approved? Sounds noble doesn't it. After all who could be against education "for the children"? Here's the cath: There are not guarrantees the funding will be felt in the classroom. instead the proposal will guarrantee Teacher's salary increases and benefits. The proposal caps local contributions to teacher pension plans and makes the State put in the future contributions that will occur over time in short having the State fund the Teacher's pensions rather than the school districts, and cause a severe imbalance in the State's budget by guarranteeing increases in funding at least at the rate of inflation or 5% regardlewss of other priorities or needs. Pay for Michigan teachers ranks fifth in the nation. Spending on education as a percentage of available tax dollars ranks fourth. Per-pupil spending is well above the national average.What do Michigan taxpayers get for that $14 billion education investment? Nearly a quarter of its students drop out of high school. Its college graduation rate is half that of the top states. Scores on skills tests are falling. A third of public high schools don't meet federal standards. And 20 percent of state residents can't read well enough to function in the workplace. Those responsible for these sorry results ought to be begging to avoid the firing squad. Instead the union-led education establishment is trying to con Michigan voters into institutionalizing its failure. Don't buy it. Don't vote to lock in continued spending increases without accountability and requirments that performance beincreased and that education for our children actually improves. Vote NO on Proposal 5.
proof to demonstrate that the taking of that property is for a public use. • Preserve existing rights of property owners. Proposal 4 comes out of the recent Supreme Court Kelo v. City of New London decision, which, in brief, held that a government entity could take land from one private person and give it to another private entity if it would be beenficial to the publiuc such as through increased tax revenue. Naturally this outraged many citizens at the prospect that their homes or business could be taken and given to developers or businesses with more influence over the unit of government that could do the taking. The proposal not only prohibits such private-government-private transfers but also the government must prove it is being taken for public use and if it is a residence being taken, the government must pay 125% of the fair market value of the property. While the proposal will certainly slow down some government planning and make condemnation of property more expensive, the resulting benefit to property owner's rights and the peace of mind that your property cannot be taken away to benefit those who have influence with the government is worth it. and Fish Protection Fund and the Fish and Wildlife Trust Fund. disabled in the Department’s annual hunting guide. A YES vote is warranted on this proposal. I'm not a hunter, but I have bo objections to people hunting doves in Michigan. The dove is a prolific bird and studies have shown that hunting them does not place their population in any danger. Apparently doves are a hard and unpredictable bird to shoot and dove meat is also tasty. Dove hunting is legal in 39 states, including our neighboring states of Ohio, Illinois and Indiana. See this Detroit News Article for a map showing the extent of dove hunting and how it is Michigan that is the abberation in not allwing such a hunt. Given that Michigan is in its very own 1-state recession, we need all the tourist and hunting money we can get from out-of-staters, and we should try to keep more such money in Michigan rather than requiring hunters to travel out of state. The side opposing the hunt seems to be beased purely on emotion and falsehoods, claiming that hunters will be shooting doves off of powerlines and people's birdfeeders. This is false. You cannot hunt that close to another persons residence in Michigan and no responsible hunter would do so. Vote YES on Proposal 3. A YES vote is in order here. Ending affirmative action will not "turn back the clock" on gains made by women and minorities, it will simply ensure that all applicants for Government contracts, jobs and educational spaces will be given equal consideration regardless of race. An interesting article by Roger Clegg in the Detroit Free Press points out the current inequity under the affirmative action system currently in place. Admissions data recently obtained from the University of Michigan show that race and ethnicity play a huge role in determining who gets in. In last year's entering class, a Michigan native with neither parent a U-M alum, a cumulative SAT of 1240 and a 3.2 high school grade-point average had a 9-out-of-10 chance to be admitted as an undergraduate to the University of Michigan -- if the applicant was black or Hispanic. For whites or Asians, the chances were 1-in-10. Suppose you were applying to U-M's law school. If you had an LSAT of 162 and an undergraduate GPA a little over 3.5, then you would have a 7 out of 10 chance of admission -- if you were black. But if you were Hispanic, your chance was 3 out of 10, and for whites or Asians, still 1 out of 10. Medical school at U-M? Well, with an MCAT cumulative score of 41 and an undergraduate science GPA of 3.6, you'd have a 74% chance of admission if you were black. If you were Hispanic, 43%, and for whites or Asians, you guessed it, 1 out of 10. The studies also tell the story using the statistical device of odds ratios. To put things in perspective, the odds ratio for a nonsmoker versus a smoker dying from lung cancer is 14 to 1. The chance of a white versus a black getting into U-M's law school is 18 to 1; for med school, it's 21 to 1; for undergraduate admission, it's either 63 to 1 (if you take the ACT) or 70 to 1 (if you take the SAT), the research shows. Simply amazing, and that dats is from only one school and does not tell us about all the contracts that have been given out preferentially or the admissions data at other schools. Proposal 2 should be passed to end this clear discrimination and unfairness and have the government of Michigan treat people equally, as it should, without discriminating based upon race or ethnicity. With the mid-term election quickly approaching I thought it would be timely to discuss the five ballot proposals that will be voted on in Michigan this year. Full disclosure: I am sadly not being paid for any of my opinions or endorsements of these proposals and my opinions are purely my own. If anyone actually wants to pay me for an endorsement (yeah, as if that would happen), please contact me soonest. The ballot proposals can be read at the Michigan Secretary of State's Website. fees; taxes and other revenues to fund accounts. and Wildlife Fund within the Constitution. A YES vote makes sense for this proposal. After all one of michigan's greatest assets is its natural beauty. Once you're outside of a city core you are surrounded by lakes, forests and other beaurtiful natural areas. Ensuring that the funds raised through licensing and fees for outdoor activities are actually used to promote and protect the great outdoors is a winning idea for Michigan. Such use of the funds will help preserve our natural resources and wildlife that adds much to the quality of life in this state. After all, the latest Michigan ad campaign is "Pure Michigan" to help highlight the quality of the outdoor experiences we offer both to our residents and tourists. Yes, Michigan is a very nice state to visit if you like the outdoors. Lets use the funds where they should be used - to keep our wilderness and wildlife in good shape for Michiganians and visitors to our state to enjoy. Proposal 1 - Vote YES. Andrew McCarthy at The National Review comments on a Federal Judge sentencing Lynne Stewart to only 28 Months in prison for assisting terrorists by acting as a willing and eager conduit for jailed terrorist leader Omar Abdel Rahman to communicate with his followers. Treating this as a law enforcement problem with its resultant slap on the wrist sentence only shows how fundamentaly unserious we are regarding this "War on [dare we say Islamist?] Terror". To put it in perspective, the Justice Department was requesting 30 years. While a darling of the leftists, Lynne Stewart enabled a jailed terorrist chief to get instructions to his followers to commit terrorist acts. Stewart has sullied her profession as a lawyer by colluding in this criminal act in violation not only of law but also the ethics and canons of professional responsibility for attorneys. 28 months is a joke for such actions. Apparently Stewart is appealing her conviction. The Justice Department in turn should be appealing this sentence. The blogger there ain't heavy, and he is my brother. Wayne State University's President, in a letter to the Detroit Free Press has stated the university will not divest from Israel. As a public institution that encourages learning, free expression and the exchange of ideas, Wayne State University recently was the site of a speech and protest by individuals opposed to the university's investment in Israel. Wayne State opposes divestiture and has no intention of divesting itself of stocks in companies doing business with Israel or any other legitimate state. We encourage our students to use their right to free speech, but accusations, acrimony and demands such as divestiture are counter to the intelligent dialogue and free discourse for which this university stands. In a complex, international economy, divestiture is by no means a responsible approach to influence political or economic policy. Rather, it is my obligation to pursue legal, rational and productive investments on behalf of the institution. It should be noted that the group leading the protest Anti Racist Action was not a student organization but an outside one. They were apparently joined by Wayne State Alumni for Divestment coalition in the protest. Good for Wayne State University for standing up and saying no to this riddiculous and one-sided demand for disinvestment against an American ally and fellow democracy. According to Codie [the schoolgirl], the five - four boys and a girl - then began talking in a language she didnÂt understand, thought to be Urdu, so she went to speak to the teacher. The British ruling elites have turned their back on the English traditions of liberty, thought and speech. It is amazing that the police seem to ignore real criminals yet hammer any English persons who exhibit "anti-social behavior" -- i.e. thoughtcrimes when directed to by a ultra-politically-correct educational system that here has clearly gone nuts. Being arrested because you didn't want to sit next to people, unbelievable. At this point I'm glad that America's founders had the good sense to revolt and get away from this madness. It was very precognizant of them to do so and to enshrine free speech into the Bill of Rights after suceeding in driving the British elites out. The Michigan State Police and the Michigan Department of Transportation have been raising limits on freeways around the state, saying that properly set limits encourage more uniform traffic speeds and, therefore, fewer crashes. Police say drivers are more likely to obey realistic speed limits, so raising the limits reduces the speed differences between those who obey low limits and those who drive faster. Reducing the differences in turn decreases the likelihood that faster drivers will change lanes, brake suddenly, tailgate slower drivers or otherwise engage in behaviors that can lead to crashes, State Police say. Bravo to MDOT and the Michigan State police for an excellent decision. Speed limits will rise to where drivers were already going that speed. The change also makes a trip more uniform - Some Highways Here go from 70 to 55 to 70 to 65 in an eyeblink, with all sorts of problems as the limit changes. A big thank you to MDOT and The MSP for this good traffic management in raising speeds to the new levels rather than chasing revenue from tickets agaisnt drivers who are already driving at that speed. The British Judicial System must have truly lost all sense of proportion, not to mention common sense. On a daily basis Donna claims her and her two children, James 14, and Holly, 12, have to put up with a 15 strong group of kids aged between 12 and 17 hanging around outside their three-bedroom semi-detached home. Donna and her neighbours have had to endure paint been thrown on their walls, plants ruined from their gardens, and late night noise from the gang who stay up drinking on the streets. On a daily basis Donna claims she has to put up with kids jumping over fences, trampling gardens, shouting, swearing, kicking footballs against windows and constant intimidating behaviour. Things finally came to a head on March 30 when a desperate Donna finally lost her temper and told her tormentors to "please, just f*** off." The youths ignored her but two weeks later officers called at her home. She was told a 13-year-old girl had made a complaint against her. Donna was arrested and charged under public order offences. She was handed an £80 fixed penalty notice but refused to pay and was taken to court last month. Magistrates then upped the sum to £120 pounds which Donna must now pay or face a possible jail term. "When the police came I thought it was because I had complained. I never dreamed they had come to arrest me." Donna claims she made countless complaints to police about the gang outside her home but nothing has ever been done about them. Let's see, we have multiple acts of threats, vandalism, noise violations and no response from police and then this poor lady finally tells them to f-off and she gets charged, apparently for scaring these kids, with such tender feelings, by telling them to f-off. But Sgt Neil Haley of the Five Towns Neighbourhood Policing Team defended the fine. He said: "Officers regularly patrol Knottingley. We appreciate that anti-social behaviour can be frustrating but people should not take the law into their own hands. "We encourage people to report criminal or anti-social behaviour by contacting the NPT hotline on 01924 294518 or email us at 5towns.npt@westyorkshire.pnn.police.uk. Note well, swearing at a malfeasor in Britain is now considered by police to be taking "the law into your own hands". Notice also that crimes against a person's property is now simply anti-social behavior. Unbelievable how far once proud Albion has fallen. A Kahr PM9 pistol in 9mm that is. Weighing under 1 pound and only 5.3 inches in overall length, with a 3 inch barrel and a choice of a flush-fitting 6 round and extended 7 shot magazine this is perhaps the perfect concealed carry firearm. Nice and flat, it can conceal easily in a front jeans pocket in a decent holster or disappear under a shirt with a similarly good inside-the-waistband holster on. After receiving my Kahr PM9, with the slide in the matte black Tungsten DLC finish and factory installed Trijicon night sights I was eager to take it to the range. The gun arrived bone dry from the factory, with evidence of it having been fired for the useless ballistics identification program required by two states, and the brass from the test firing was in an envelope that came in the firearm case. The Kahr clearly needed some lubrication before taking it to the range. Taking apart the Kahr PM9 is relatively simple: Line up the disassembly notch and then push the slide stop out of the frame. This required a bit of work as the slide stop is in tight, and needed a little encouragement in form of taps from a plastic hammer to work its way out. After swabbing the barrel to ensure there were no hidden obstructions, cleaning off the firing marks from the test firing and adding some Tetra lube to the slide rails and barrel hood, it was time to reassemble. Reassembly took a little work, with lining up the slide on the frame and getting the striker assembly out of the way so the slide stop could be replaced and the slide move freely. 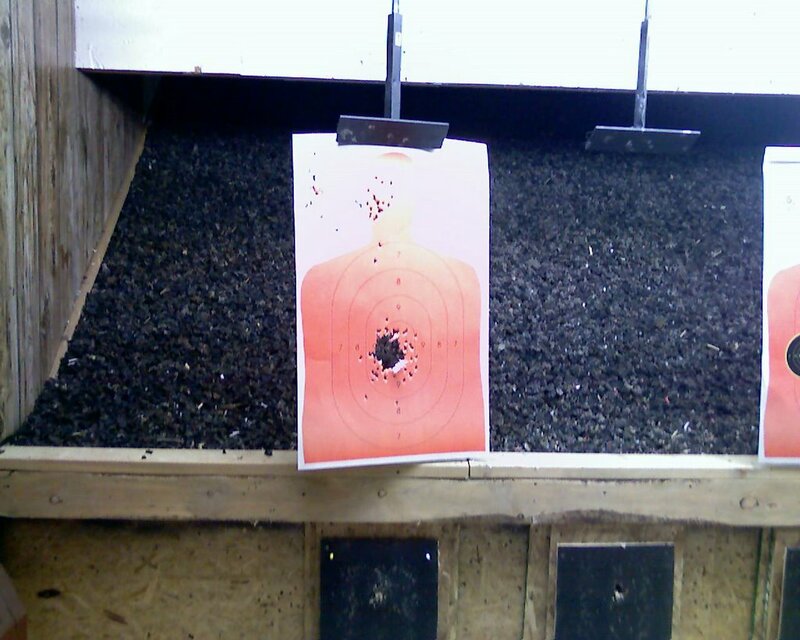 With that done it was off to the range. I brought with me 2 boxes of 100 round Winchester white box value pack 9mm fmj ammo and 1 box of 50 Federal Hydrashock hollowpoints. As the manual said it takes 200 rounds to break in, I took it at its word. On the first magazine there was one glitch where on the final shot the fired brass failed to eject but sat on top of the magazine and was easily cleared. This did not happen again during the session. On firing the Hydrashocks I was in for a bit of a shock – the muzzle flash from those rounds was significant, so much so that it appeared that I was using a flamethrower. This would not be good in a night time situation as the flash was very visible in the relatively good light of the indoor range. In addition, of the 50 rounds fired there were two failures where the slide failed to go back into battery and pick up a new round, so I would not consider this batch of Hydrashocks as reliable carry ammo for this gun at this point – maybe it was the 250 round break in. On the upside, the Hydrashocks were as controllable as the white box ammo with similar accuracy. The PM9, despite its small size was easily controllable with either the flush fitting magazine and even more controllable with the extended seven round magazine, and quite accurate at 10 yards, as can be seen from the accompanying photo of the target below. The trigger pull on the Kahr was a bit long but very, very smooth – certainly the best pocket pistol trigger I’ve ever shot, easily besting my comparably sized Hungarian made Walther PPK-clone and my Russian Makarov. There was no real significant recoil issues and controlled pairs of shots or even rapid strings were easily made and still accurately hitting the target. The only downside to the Kahr are its array of sharp edges – the magazine feedlips are razor-like in sharpness (as the cut on my finger can attest), presumably on the theory that if you run out of ammunition you can pull out the magazine and use it as a last-ditch knife. In addition the top of the slide release, where you push down to release the slide is likewise sharp, as are the slide serrations for pulling the slide back. A little smoothing of the edges on this not-cheap and otherwise excellent firearm is certainly called for and would be an excellent improvement in the user-friedliness and carryability of the product. Others at the range also tried it and was impressed with both its controllability and its small size. 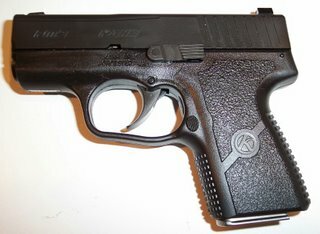 The firearm is similar in size to many .380 caliber handguns and packs a more effective round and a better trigger as well. In short this is possibly the finest pocket gun available, sharp edges and all, and I highly recommend it for those looking for an easily concealable firearm to accompany your carry permit.